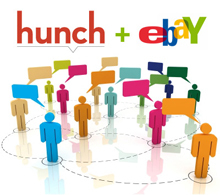 Hunch will expand eBay customers' ability to buy, sell. eBay has acquired Hunch, an online platform that provides recommendations based on users' tastes, the marketplace announced on Monday. The acquisition will give eBay users a broader opportunity for buying and selling by suggesting products and search results based on customers' tastes, eBay notes. "With Hunch, we're adding new capabilities to personalizing the shopping experience on eBay to the individual relevant tastes and interests of our customers," says Mark Carges, eBay's chief technology officer and senior vice president of Global Products and Marketplaces. eBay merchants will benefit from Hunch services because their products may be recommended to buyers who will have a higher likelihood of liking what they offer, eBay notes. "Hunch's technology can help sellers understand the demographics, psychographics and preferences of their browsers, bidders and buyers," adds Johnna Hoff, eBay's senior manager of Media Relations. "These actionable insights are innovations that will help sellers refine and optimize their messaging, product offerings and promotion strategies to maximize their sales potential." Hunch uses patented technology, referred to as a "taste graph," to predict what a user's preferences might be by using a customized rating system of interests. As Hunch learns about users' interests, it can recommend services, websites, products and just about anything else based on what similar users are interested in. Hunch launched in 2009 and later began working with other businesses to provide online personalization and data-driven insights about their customers. This will be integrated and put into effect as of when? Capital will help Shipwire expand into new countries. Site aims to unearth items hard to find amid flood of retail merchandise. Marketplace plans to make a bigger push into social commerce. Image-recognition feature coming soon, Donahoe says. Survey finds Amazon, eBay are top retail sites visited by mobile means. Offers expected to draw on customer data and Where technology. The invoicing technology gives online shoppers more payment options.